Located at the heart of historic Amsterdam, The Grand truly lives up to its name in every respect. 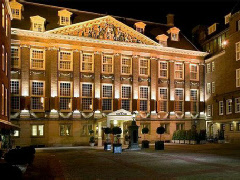 Since being a convent in the 15th century, a royal inn during the 16th, and successively the headquarters of the Dutch Admiralty, the building was only transformed into a hotel in the early 1990‘s. The Grand Amsterdam’s three “Royal Suites” are named after former residents: Maria de Medici, William of Orange (later William III of England), and William V.